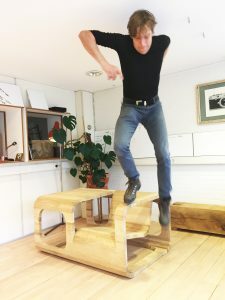 Designs, creates and delivers furniture and useful objects and technical delights. Lifetime Guarantee. I love to serve people with furniture design, producing and placing, and pampering them entirely in the process. Creating furniture or an object that has been worked out down to the last detail, which will fit the client and his/her environment like a glove. That’s what I love doing the most. I like to make useful objects: tables; chairs; desks; beds; staircases; benches or a combination thereof. Building unique items is my forte. Do certain tools and techniques need to be developed in order to establish them? All the better. I love doing all of this in cooperation with go-getters, sparring partners, the ambidextrous and technical professionals. Anyone who wants or needs something unique. Firstly I meet the client and his/her environment personally to map out his/her wishes. At that moment I observe the location where the furniture object needs to be placed. This situation is turned into a 3D model so that we have a canvas for sketching - initially with a pencil, and after in 3D. When the design is finished, I present it to the client for further refinement. Together with the client, a definitive choice of materials is made, which is often dependent on his/her taste and budget. If everything is agreed upon, the materials are carefully selected and purchased; after which the furniture or object is made. My clients are involved in the process as much as they want and are always free to stop by during the process. It has happened that a client wanted to cooperate with the making or placing process; there is room for that too. I work with many different materials and I generally don’t have any particular preference for using a specific material. Every material has unique properties that I sometimes want to use. we work with - and design in - metal, wood, synthetic stone and make use of a 3D printer. I highly prefer to work with durable high-quality and environmentally friendly materials and techniques. By definition, it’s impossible for a furniture manufacturer to not be stressful for the environment. Of course I try to be as ecological as possible. Therefore I select materials with the greatest care. FSC certified timber or regional wood e.g. Form and user requirements always go for technology. If certain techniques aren’t sufficient for a specific project, I’ll develop new tools myselfs, or in exceptional cases we even create a new furniture making technique. For example, I’ve developed a technique to make the solid wooden chair pictured below. The chair consists of curved forms only. I call the technique ‘’Spanhout’’. 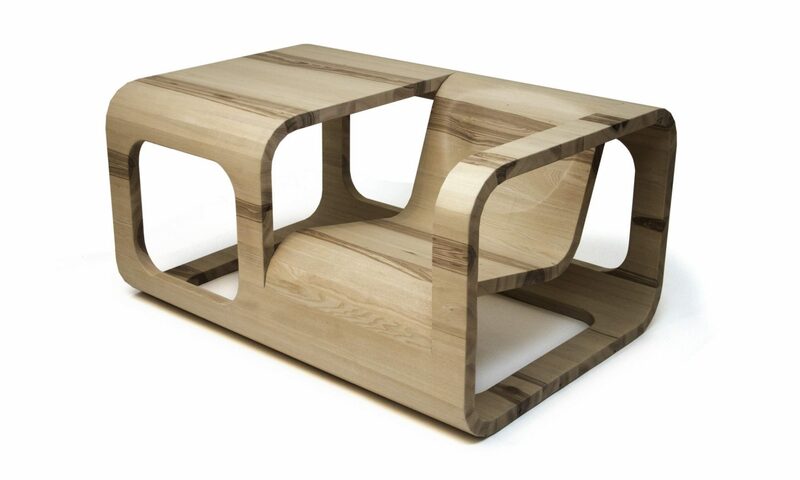 The solid wood parts are seamlessly stretched together with internal cables. This is done in such a way that the wood is able to expand and shrink while the wood in its whole remains seamless. Glue and screws are history by using this method. 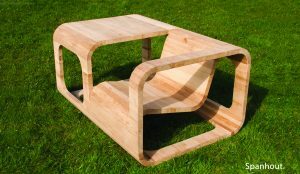 Why do furniture making besides designing? I’ve always had a love for design and I love working with my hands. I found that I have two right hands and a predilection for technology. Where does this love come from - nature or nurture? Well, my family consists largely of designers, artists and art-lovers. And technically? I was brought up with the idea that you can learn and understand everything, by disassembling and putting everything together by actually trying it. I’ve always loved technology, so that’s been a great help. Which education did you follow? I’ve been a student of a master for three years and I’ve made furniture for luxurious private yachts. Together, we’ve created a lot of complicated shapes and furniture in- amongst other things - Jugendstil style. From there I’ve evolved with a lot of common sense, inquisitiveness and practical experience.